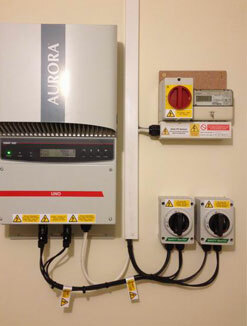 Meridian Environmental offer a highly professional service for home owners wanting new installation additions to existing electrical circuits, as well as complete re-wiring. From a few extra sockets to electric showers, from kitchen to complete house rewiring, we offer a complete professional service.We can design, install and certificate the work so that it complies to the latest NICEIC Regulations required by the local building authorities. The installation will be designed to fit your requirements and be installed by highly professional fully insured electricians. Our qualified electricians have many years experience in houses electrical wiring. They are quick and efficient. We can supply a team of electricians to complete the project quickly, thereby minimizing the disruption to your household. We offer a complete rewiring services for all types of domestic properties. This also includes advice on the type of installation you may require, installation of all new cabling, correct type consumer unit for your premises and all electrical accessories according to IEE Wiring Regulations. All electrical works are fully guaranteed and carried out by our NICEIC Certificated approved electricians for domestic electrical installations. Bathrooms are unique in the home when it comes to electrical service. By nature, bathrooms are damp environments and water and electricity make poor bedfellows. Recessed lighting is an excellent choice for lighting up showers, baths and toilet areas. In the shower and bath, recessed lighting can be angled to bring out tile design, stone inlays and other decorative design features in those areas. From complete bathroom wiring, spot lights to installation of underfloor heating systems and electrical bathroom appliances, our electrical team can help you. The key to knowing how to wire a kitchen is forethought and planning. The use of electrical services in the kitchen surpasses any other room in the house. Consider how much electrical power the cooker, oven, and range use. There’s a lot more to electricity in the kitchen than meets the eye. Behind the scenes are special electrical receptacles, different kinds of kitchen lighting, an increasing number of appliances, power points and more. A common result of a fire risk assessment will be the need to install and maintain effective detection equipment. Meridian Environmental, the NICEIC registered fire alarm systems experts, can help! We carry out fire detection equipment, installation and maintenance in Dorset & the surrounding counties. Our experienced team will meet with you to discuss the results of your fire safety assessment, before supplying and installing detection equipment and fire alarms. We can also fit, maintain and replace your smoke alarm if your existing units need updating to comply with regulations. We are well known for our customer services and the quality of our electrical work. More important than your home itself are the people and your special belongings that are in it. With that in mind, one of the most important things that you can do to protect your loved ones and belongings is to install the right kind of outdoor security lighting for your home. Contacting a qualified electrician to help you plan your security lighting is the first smart move to ensuring that you are making the best lighting plan and that the lights and timers you choose will be properly installed and certified. We are NICEIC – registered specialist electrical contractors and are fully insured to comply with the new building regulations (Part P) which came into force in 2005. We offer a full range of electrical inspection and testing services, helping landlords, building owners and operatives to comply with health and safety and fire safety regulations for buildings. We are qualified to carry out NICEIC periodic inspections on any size of building. We offer a full test and inspection service to establish the safety of installations and ongoing Periodic Testing to identify any possible deterioration, regardless of how big or small. Full National Inspection Council for Electrical Installation Contractors (NICEIC) certification is issued by Meridian Environmental on completion of any repair or install by our qualified electricians.